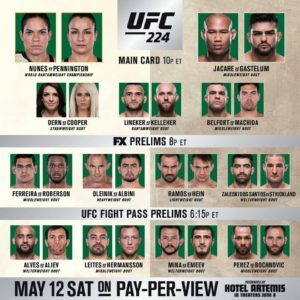 The Ultimate Fighting Championship is at the Jeunesse Arena in Rio De Janeiro, Brazil, for UFC 224. The main event has Raquel “Rocky” Pennington challenging Amanda “Lioness” Nunes for the UFC women’s Bantamweight Title. Amanda Nunes the defending champion comes in on a 6 fight win streak. The champ comes in already having defended the title twice defeating Ronda Rousey (TKO) & Valentina Schevchenko (SD). Raquel Pennington earned this title shot with a 4 fight win streak. We last saw “Rocky” taking a unanimous decision from Meisha Tate, but that was at UFC 205.